There was about an inch of new snow on the ground but we bare-booted up the wide and well-traveled trail. We passed a group of people resting on a boulder and I hoped that they weren’t heading for the summit as some in their party were dreadfully under-prepared for it in their jeans. As we closed in on Tuckerman Ravine the number of tracks in the snow from other hikers dwindled. We closed in on Hermit Lake and got our first view of the ravine. Clouds were still laying heavily on the mountain, but the forecast said that it would be trending toward clear in the late morning. We held up hope that it would be clear on top by the time we got there. We reached the small medic hut in the Tuckerman Ravine bowl just as a group from Quebec was heading up the trail. We stopped for a snack and to put on our microspikes as the climb was about to get real and the trail was looking icy. As we got to the headwall in Tuckerman Ravine a man and a woman were heading down. They were not wearing any traction and the trail was too slippery for them to go any further. We continued up, slowing only to marvel at the ice forming on the cliffs above us. We hurried past a spot where the trail switchbacked directly under a cliff. 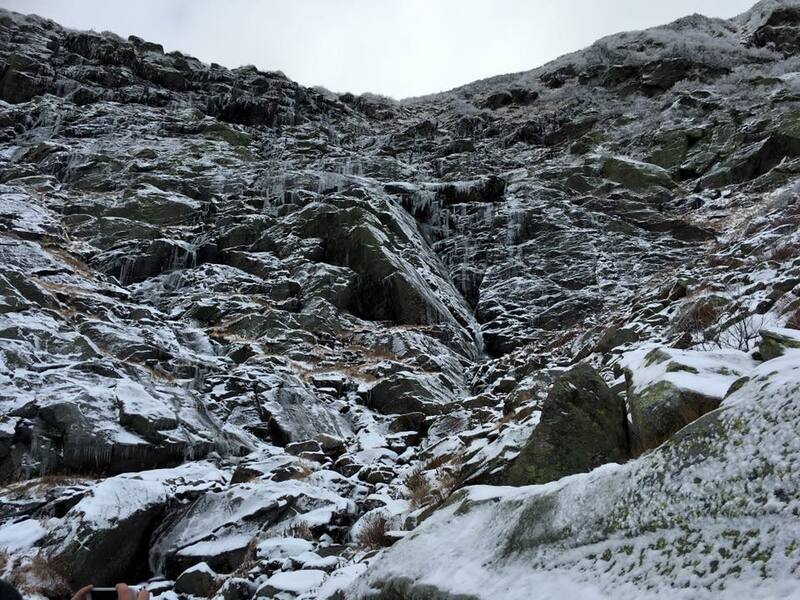 The trail was scattered with the remains of fallen icicles and falling ice was apparently one of the dangers of Tuckerman Ravine in the colder months. We did not want to be victims because we lingered in the wrong spot. As we started to approach the lip of the ravine we passed the group from Quebec. The snow accumulation was starting to get a little deeper and none of them had traction for their feet. They were eating an early lunch and deciding whether to push on or not. Personally, I would not have wanted to go as far as they already had without traction. The trail was wet and icy and coated with powder snow. A slip would be treacherous. As we continued past them we realized we were breaking trail; there were no longer any footsteps through the snow ahead of us. It had only been the couple that turned back and the group from Quebec ahead of us. To make matters even better, the clouds were dissipating as we approached them. As we got to the top of Tuckerman Ravine, the clouds on top of Mount Washington still looked pretty thick. We decided to keep heading toward the summit and hope that the clouds would continue to dissipate. By the time we got to the intersection with the Tuckerman Crossover Trail the clouds had faded enough for us to catch glimpses of the peak. We were also starting to feel the strong westerly winds. We suited up for the push to to summit and slowly ascended the rocky climb, fighting with the gusts from our left. It seemed as we climbed the clouds receded in front of us, it was looking like everything was turning out favorable. But, about a quarter of a mile from the summit John was making a big stretch to climb over a boulder when strong gust hit us. As with about every other step, I had to catch my balance as to not topple over in the wind. John groaned as he pulled himself up the rock and then started stretching his back. He had overextended himself and in fighting the wind pulled his back. We stayed put for a few minutes so that John could attempt to loosen his back. He decided that his back was going to continue to hurt whether or not we went the last bit to the summit, so we might as well enjoy the summit. Unfortunately, while we were waiting for the pain in his back to ease we were passed by a young couple, so we wouldn’t be the first to the summit that day. We took our time the remaining quarter of a mile and got to the summit area at 11:45 am. We had to walk across the road and parking area in a crouched, half-crab-walk due to the intense wind speeds. There was only a minimal (if any) frost buildup on the ground, but our microspikes were key to keeping our traction in the wind. To make maters even more exciting, ice chunks were flying off the surrounding buildings and instrument towers so we were regularly pelted by the icy projectiles. As we approached the sign at the summit we passed and high-fived the couple that got there ahead of us as they were leaving. 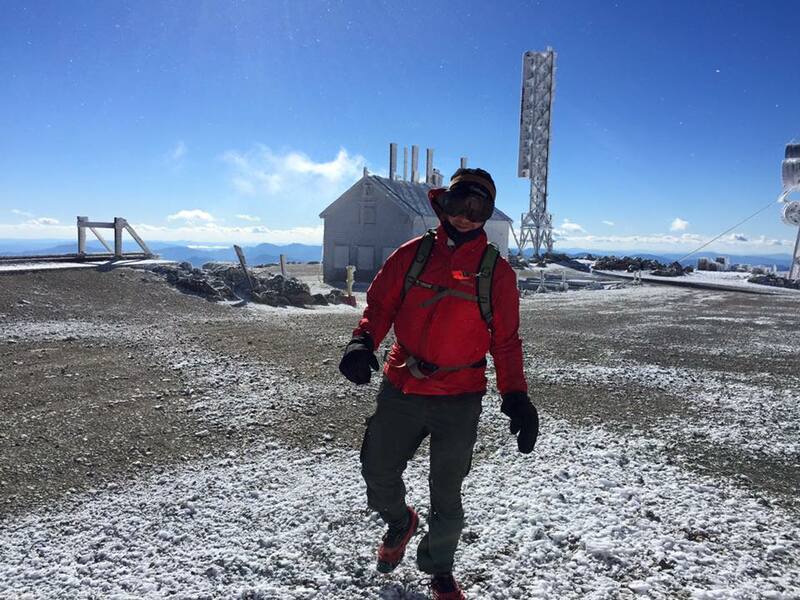 For a little while we had the entire summit of Mount Washington to ourselves on a completely clear day. After a photo by the summit sign we made our way to the observation deck so we could get a view of the northern Presidentials, a view I hadn’t witnessed before due to clouds every previous time I climbed Mount Washington. We ended up spending a while on the observation deck experiencing the wind. I had never witnessed such a strong force before. I was able to lean into the wind at over 45 degrees with my arms spread and not fall to the ground. During some of the gusts I could feel the pressure drop in my ears and I wasn’t be able to catch my breath. We later looked at the Mount Washington Observatory’s monthly raw data and saw that the strongest wind gust for the day was 93mph. What an amazing experience! Before heading down we stopped behind the summit building to rest in its lee. Other people started to arrive to the summit and made their way toward us. None of the people we saw had traction and they were struggling against the wind. 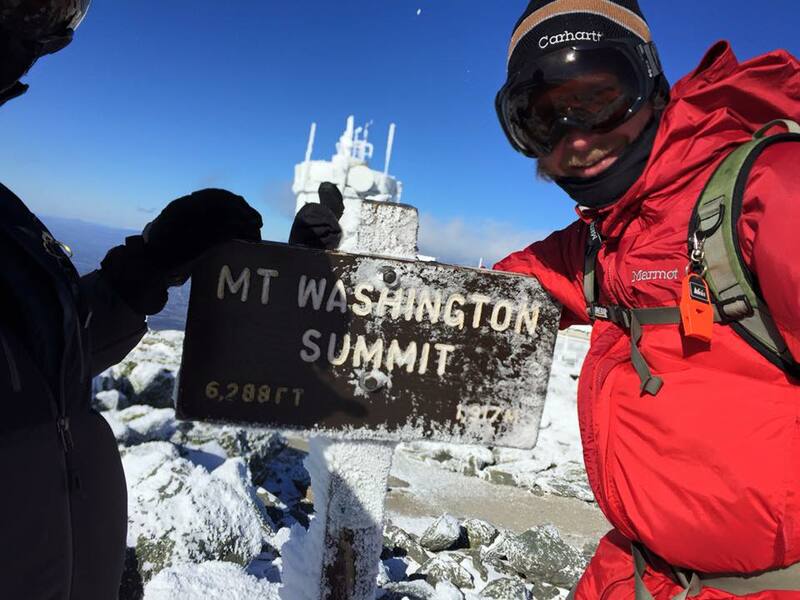 A couple of them were wearing jeans; cotton on the summit of Mount Washington in November, unbelievable! Several people looked completely exhausted and were disappointed to find that the summit building and cafeteria within were not open. I was shocked at how unprepared people were. We took our time on the hike down so that John would not tweak his back. 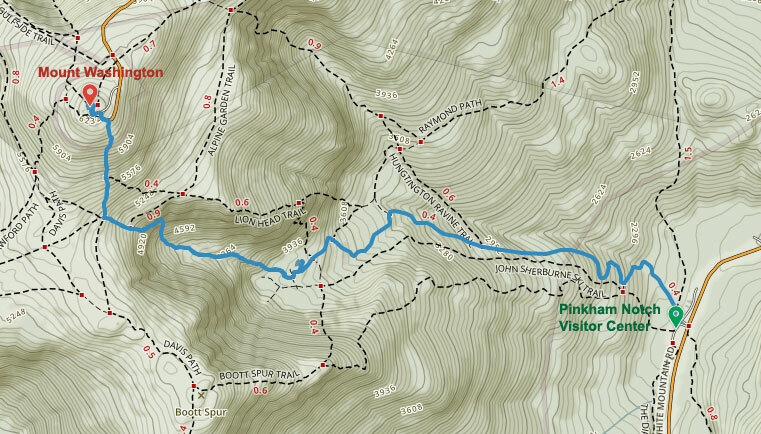 Due to the wind we decided to stick to Tuckerman Ravine Trail instead of Lion Head Trail which was exposed. Once we got back to Tuckerman Ravine and out of the wind the hike was most pleasant. The sun was shining bright and the snow and ice was melting. It was a most epic hike, one that I can’t wait to repeat. Mount Washington is an amazing mountain that I point to and shout: “Mount Washington” every time I see it from a distance, like a kid pointing at a toy in a store window. Despite that I typically stay away when the auto road is open due to the crowds. It was a joy to visit the highest summit in the northeast and have it to ourselves. 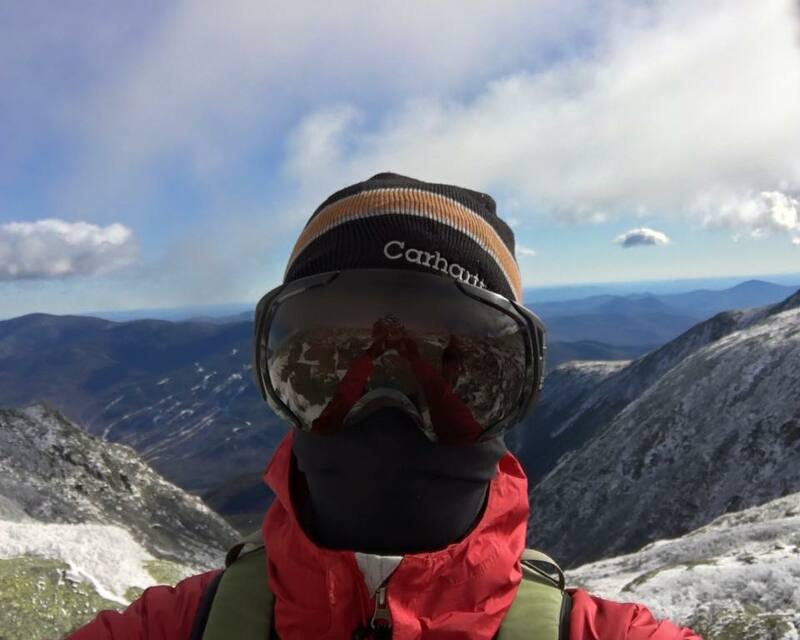 As a reminder to all who might attempt this hike and any other high summit in the northeast, please hike safe. Research your hike, keep an eye on the weather and make sure you’re properly equipped for the season in which you’re hiking. There is a ton of free information out there in the form of blogs and forums where any question you might have is answered. There is no excuse for being under-prepared. The mountains were there and so was I. 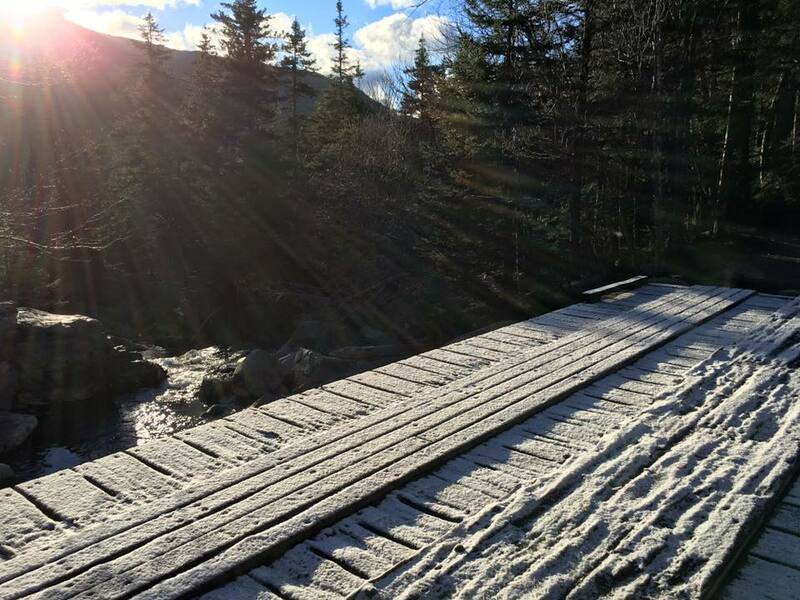 “November 2015 F6 Report.” mountwashington.org. Mount Washington Observatory. Web. 27 January 2016. 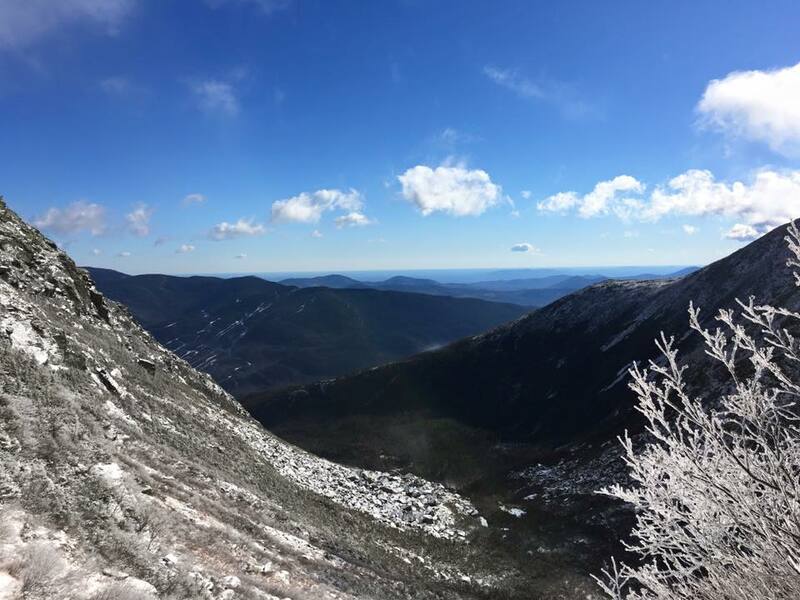 This entry was posted in Hike and tagged 4000 Footer, Hike, Maps, Mount Washington, New Hampshire, Outdoors, Trails, White Mountains, White Mountains National Forest. Bookmark the permalink. Wow…I envy the hike. I climbed mt. Washington in 98. Its crazy what people wear and bring to a mountain capable of 200mph winds. Thanks for sharing your experience, I hate it when bloggers lack good pictures.